Panic! 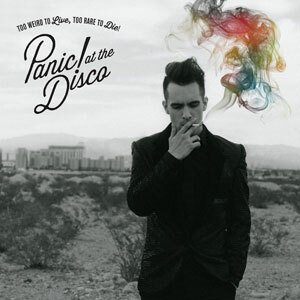 at the Disco’s fourth full-length Too Weird to Live, Too Rare to Die! is as eclectic and diverse as anything we could’ve imagined, which was hinted at by the soulful lead single tease of “Miss Jackson.” Of course, by now we’ve learned to expect nothing less than the unexpected out of the quirky alternative band from Las Vegas. The group’s latest effort is noticeably inspired and shaped by Sin City’s gritty darkness as much as its glitz and glamour, hence it seems only fitting the album’s title is taken from Hunter S. Thompson’s novel Fear and Loathing in Las Vegas. Teeming with melodic hooks and reflective lyrics, Too Weird to Live, Too Rare to Die! is both hypnotic (the lingering closer “The End of All Things”) and beguiling (Far Too Young to Die” and second single “This Is Gospel”). Also worth noting are the two extra bonus tracks (“Can’t Fight Against the Youth” and “All the Boys”) featured on Target’s exclusive deluxe disc version, both of which merit foregoing the digital download route. Cher may be a good candidate for heated water cooler debates, but whether you love, hate, or are simply indifferent to her, she is irrefutably iconic to millions, and has managed against all odds, to pull off an unparalleled and long lasting career. Over the span of six decades, the fashion daring diva has successfully conquered television, film, and music, sold over 100 million records, and amassed a variety of awards including an Oscar, a Grammy, an Emmy, and three Golden Globes. Cherilyn Sarkisian, who became a household name thanks to the classic pop duet “I Got You Babe” in 1965 with her then husband and partner Sonny Bono, holds the distinct honor of being the only recording artist to have had a number-one single in each of the past six decades. Now, 12 years since her last full-length recording (2001’s Living Proof), Cher has returned with what she insists will be her last effort. On her twenty-sixth solo album, Closer to the Truth picks up right where Cher’s musical legacy left off, with an auto-tuned anthem (“Woman’s World”) and a sassy club banger with a feminist slant (“Take It Like a Man”). However, those hastily tempted to write off Closer to the Truth as just another dance record may be surprised to find it includes three tracks co-written by Cher herself and offers a multitude of tempos, including a handful of ballads, which clearly demonstrate Cher still has the chops to amply deliver a powerful and emotive lyric in her inimitable style. With a pair of tracks supplied by P!nk, and production from Timbaland and Paul Oakenfold, Cher shows she’s kept her finger on the pulse of music during her extended absence. Moreover, the woeful 9/11 inspired “Sirens” and the stirring “I Hope You Find It” (thankfully rescued from Miley Cyrus), both easily position themselves among Cher’s strongest material to date. If this is truly Cher’s swan song, then she should be content that Closer to the Truth is nothing less than a fabulous finale to her illustrious career.